Susan and Shannon have done something simply AMAZING, but even if we had a hundred Susan and Shannons it we could only tap a drop in the bucket of the potential these horses have. They are only two people - their effort has been beyond superhuman and their dedication and faithfulness to this cause incredible. How I wish there could be more people like that preserving valuable bloodlines - so very many have been lost and/or so blended with other lines as to have scarcely any distinctive family identity that can be reliably reproduced! The whole Morgan breed is amazing, and there are many families I wish could have been saved. Do you know the Bulrush sireline, of Justin Morgan's three main sons became extinct only within the last 25 or 30 years and there were horses that were inbred with many crosses to Bulrush lines, it could have been a family similar to Lamberts or Woodbury, but it is all gone. Susan and Shannon have literally dedicated their lives to preserving this ONE family of Lamberts, they could not do them all. Their approach was very different than the Lippitt Club, and not to discount what those people did, it had its place too - but the Lamberts of Quietude are, literally, a work of art, they could be a whole breed of Criterion horses unto themselves. Yet any of the old New England farmers if they were alive today and could come to Quietude would instantly recognize these horses as the best of the pure old Morgan type and they would be beating down Susan and Shannon's door wanting to buy them and/or bring their mares etc. Still and all, they are only two people, even though their effort has far surpassed anything that could be imagined or reasonably expected. They have NUMEROUS amazing stallions and amazing mares and there is just no way they can allow or produce all the potential matings that could or should be done. So many stellar horses they have are basically idle as far as breeding, because however hard they try, they can only do so much. This is absolutely one of the most gorgeous Quietude mares, possibly my very favorite. She is an own daughter of Crispin who was definitely one of the very best sons of Criterion, able to produce both prepotent sons and daughters. However daughters of Crispin are among the best of Lamberts. Crispin had the most AMAZING action. His stride was unbelievable! Every Crispin daughter is a breeding treasure. Taffeta's dam was by Calcutta. Calcutta was another outstanding son from the golden cross of Criterion x Libby Ashmore. Calcutta was stunningly beautiful, his coat a dark burgundy chestnut of iridescent metallic sheen and his movement was absolutely gorgeous. He was so perfectly balanced and proportioned in every way. However, he had only 25 offspring while Crispin had 43. That in itself is amazing enough if you consider these were only two of the stallions Susan and Shannon had, and they were able to let those two stallions have 68 foals between them. But, for preserving a sireline, or even descendents, it is oh so fragile a thread! Taffeta's second dam was again by Crispin, her 3rd dam by Cavendish, and 4th dam by Lippitt Ashmore. Tail female she goes back to Hale's Green Mountain Morgan. This mare was foaled in 2003, she is 13 years old - but she has only had ONE foal, a gelding! She has several more good breeding years left in her but as of now, her powerful genetic force is going to be LOST! This is in no way Susan and Shannon's fault, they have so MANY there is just no way they can breed all of their horses and give each one an adequate chance to show their breeding potential. All the Quietude mares are outstanding but Taffeta is perhaps most exceptional of all. She is correct and balanced in every way. Her body is full and deep and round, but not too thick. She has the best neck of all the mares, perfect length, arched and graceful. Her hip is long and smooth, yet perfectly balanced with a short strong back and well-laid back shoulder. 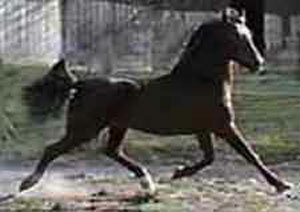 Excellent motion on both ends, her stride is definitely reminiscent of her sire, Crispin. Notice the way she flags her tail - pure feminine grace. This mare is an absolute gem! If I had horse property instead of having to pay a small fortune to board, and the ability to breed and Susan and Shannon were willing I would buy this mare in a heartbeat or at least get one of her foals. Of all the herd I would put her at the top of the list to preserve because as of now, at 13 years old she has NO breedable descendants, and her heritage and quality are immense. Then there is the stallion, Quietude Highland Trace. He is an own son of Quietude Jubilee Kingdom, which as you know has emerged as Quietude's senior stallion. He should still have several breeding years left and has had 30 foals - but not one registered since 2011, and only six stallion sons, NOT ONE OF WHICH HAS A STALLION SON, just a single colt from one who was gelded. Another precious golden thread, so very, very fragile and it will be an immense tragedy and loss to the breed if his sireline does not breed on but it appears it too will be LOST if something isn't done! Highland Trace was Jubilee Kingdom's FIRST son kept a stallion, and Susan and Shannon wisely retained him. But he has only TWO offspring, one gelding, and the mare Quietude Sally Summertime, which they also retained. 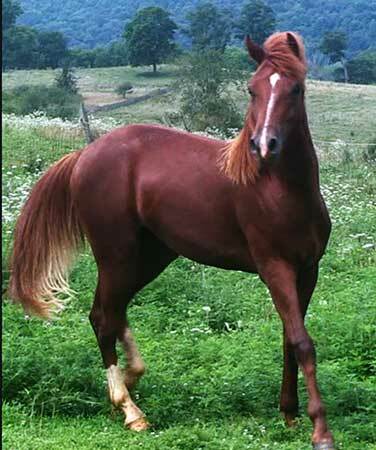 And Sally has NO registered foals, her valuable genes are going to be LOST to the breed. Highland Trace is out of Comfort of Quietude, foaled in 1978, one of the original, exquisite daughters of Criterion, a perfectly balanced and correct mare, dam of 13 foals, and Highland Trace was her last son. Highland Trace's second dam was Aurelia Ashmore, another daughter of Lippitt Ashmore, 3rd dam Jubilee's Amber, own daughter of Jubilee King, 4th dam Townshend Lass by John A Darling, 5th dam the remarkable mare Gladwin by Ethan Allen 3rd, and again, tale female goes to Hale's Green Mountain Morgan.If it were in my power to do, I would TOTALLY breed Taffeta to Highland Trace! Alright, here is another example. Consider Quietude Merit. Foaled in 1988, Merit is one of the oldest stallions left at Quietude, his remaining breeding days are numbered. You asked about the three available colts, well, Matisse is one of Merit's sons, in fact his last son, born last year. Merit has 18 offspring, and only TWO stallion sons, of which Matisse is one, the other has NO offspring. 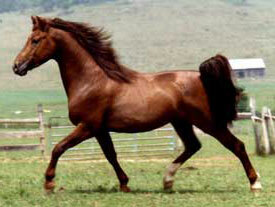 If SOMEONE does not buy and use Matisse for a stallion, Merit's sireline is going to be LOST! Merit is an own son of Calcutta whom I have already mentioned. His dam was a daughter of Dulcimer of Quietude, a little Woodbury mare, one that tragically was lost in the barn fire years ago. This mare, bred by Susan and Shannon and foaled in 1978 was a daughter of Dyberry Royalton who traced his sireline to Justin Morgan in 10 generations. His female line went through the remarkable endurance mare Bridget, tracing his tale female line to a daughter of Royal Morgan (Sherman by Justin Morgan x daughter of Justin Morgan. Dyberry Royalton had AT LEAST 51 crosses to Justin Morgan in 10 generations. 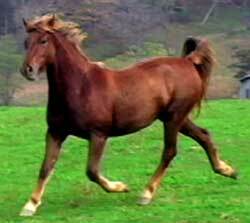 Dulcimer was a special mare - I can still see in my mind's in one of the videos Susan captured, Dulcimer trotting on the crest of the hill, silhouetted against the evening light, her motion pure, heavy mane and tail flowing. She was another golden cross on the Lambert blood. Now, if you consider Matisse, his dam was the lovely mare Quietude Wild Tansy, an own daughter of Courage of Quietude, son of Criterion foaled in 1979 out of the wonderful mare Town-Ayr Gay Cindy, among Susan and Shannon's foundation stock. Cindy, like Criterion, was an own daughter of Jubilee's Courage, and she was foaled in 1959 and produced 10 foals. Cindy was one of the rare exceptions in the clean-blooded Lambert concept, her dam Lippitt Gaiety being a granddaughter of Mansfield (Bennington x Artemesia). That said, it should be pointed out that General Gates (Denning Allen x Fanny Scott), foundation stallion for the US Government farm and grandsire of Mansfield, was out of Fanny Scott who, through her dam was just 4 generations to Justin Morgan. Bennington, son of General Gates and sire of Mansfield, was able to boast that his second dam was own daughter of the elegant Cabell's Lexington who could boast a cross to Justin Morgan in 4 generations, 2 more in five and many more in six. Mansfield was himself a remarkable sire, with 151 registered foals, and was out of the famous mare Artemesia whose breeding was impeccable. 3)As much as within your power lies, preserve those lines which are most likely to go extinct otherwise if you do not breed them - meaning a) extinct in sireline of different sons descending from Criterion, or b) extinct simply in any descendants at all from sons or daughters of Criterion, and/or other meritorious grandsons/granddaughters etc who have no other descendants to breed on. Consider that almost ALL the surviving breedable Lamberts have a unique genetic package. If you must pick and choose, try to focus on as much old blood as you can, diversity of different lines (because the Lambert gene pool is already very limited and bred very close - Susan and Shannon have done a tremendous job and shown astute wisdom in knowing which horses to save for breeding and which could be bred very close. 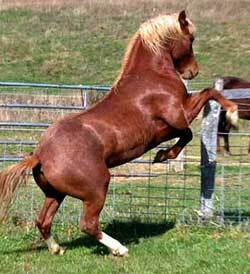 The Lambert lines are of such high quality they can stand close breeding far more than most other programs but even so, remember Susan and Shannon have for decades operated their program with SEVERAL different stallions and mares which enabled them to keep sufficient genetic balance. If someone else comes along and starts breeding with ONE stallion and a few good mares, that is a good place to start but still a whole different ball game. 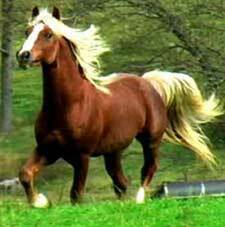 That said, if there is ANY WAY POSSIBLE, my recommendation for you would be to start with a minimum of TWO stallions. Quest's dam is Quietude Coral Sea, an own daughter of Crispin, out of Susan[s exceptional mare Caress, own daughter of Criterion. Carress's dam was Caven-Glo Ballerina by Cavendish, 2nd dam Libby Ashmore by Lippitt Ashmore and tail female going back to Hale's Green Mountain Morgan. This extremely rare and valuable line is litera lly hanging by one thin thread in the beautiful colt Quietude Picasso. Then there is Taj Mahal, another beautiful colt. 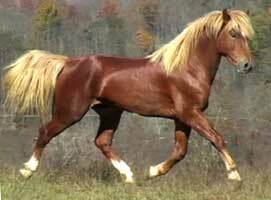 He is the ONLY cb stallion son of Quietude Tanager, own son of Crispin out of Caress. Tanager is a full brother to Coral Sea, the dam of Quest. His dam is the lovely India, daughter of Barcelona out of Honor of Quietude, thus she is a full sister of Jubilee Kingdom. So, even Jubilee Kingdom's sireline and the whole Crispin sireline is in grave peril, they are all hanging by the barest threads. And you are correct, though many have purchased Lamberts, very few are trying to breed them and preserve the cb lines, and they cannot do many. Well, this is very long and I have barely touched the subject, but hopefully it will give you some ideas to start. More later!